Gallery Kaiela is rebranding to our new name, Kaiela Arts. 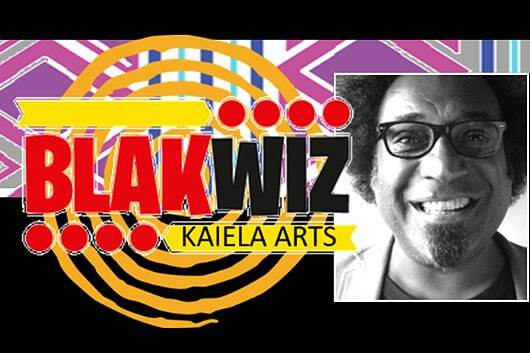 To celebrate, our artists at Kaiela Arts have written and developed in collaboration with comedian Jason Tamiru a onetime only hilarious show spectacular – BlakWiz Kaiela Arts. BlazWiz Kaiela Arts is a HUGE community event with lots of family fun and laughter with surprise appearances from local identities. Watch out for very own Uncle Herb Patten playing his infamous GumLeaf instrumentals and our new TV advertisement. The comedy event debuts 7:00pm at the Rumbalara Football and Netball Club on the 19th November 2016 for a family fun night. About Jason Tamiru from the Yorta Yorta Nation. Don’t miss out on this one time only show!